I don’t know anyone who follows the sport of sailing, either competing, officiating or just as a sporting enthusiast, who wasn’t taken in by the 34th America’s Cup last week. Even my local mechanic who naturally knows more about cars than boats said he watched the goings on in San Francisco. I’m probably one of only a handful he knows who sail! I was astounded by the feats of the sailors in handling these beasts at speeds of 40+ knots. These speeds were unheard of until only recently and here we were watching two boats battling it out daily, going to windward at 30? In 20knots of wind, just incredible. It will be more than interesting to see the coming 12 months of discussions for the 35th event. What type of boat, will it have solid wings or will they go back to soft sails as a cost cut? Monohull or Multihull? We will just have to wait. 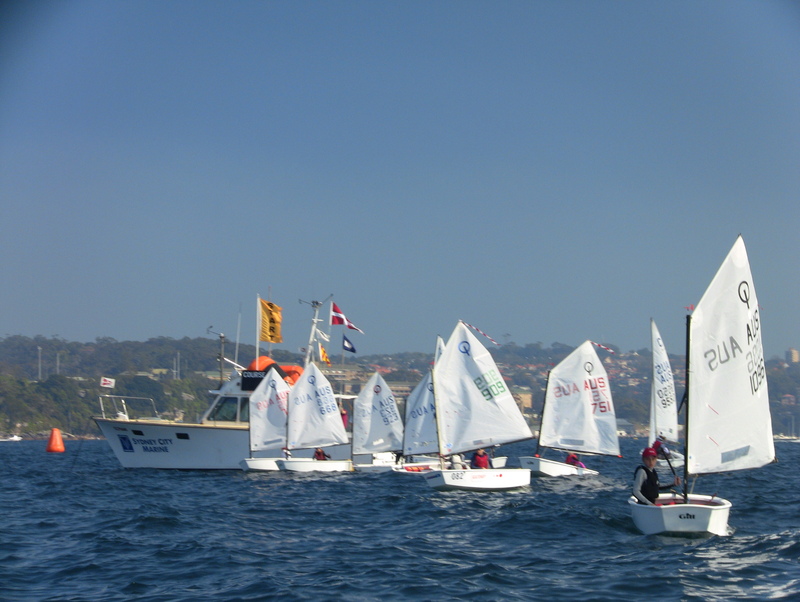 Last Saturdays race on Sydney Harbour was a blow out for several clubs. When I took out the little MHYC start boat Sandpiper, it was a lovely 10knots even though the forecast was for much more. By the time we set the start line and re set the pin end, it was blowing in to the 30s. The anchor winch couldn’t hold the chain, so it was racing abandoned for the day. There was only one complaint that i heard of, everyone else was happy to be back in the bar, or was it because the AFL Grand Final was on? From this weekend, I’m off to South Australia and Victoria on a two week DeckHardware trip seeing customers old and new. First stop is Port Lincoln, then I’ll work back around the southern coastline of Australia. Well the sailing season on Sydney Harbour is now under way for the summer. Last week we had a small but quality fleet racing at Middle Harbour Yacht Club. We were able to get them away on the SouthEast course with about 10-12knots and a clear sky, just nice. In the Open Division it was a battle between the two DK46s Nine Dragons and Exile with the Farr40 Transfusion leading around all the marks and until the last couple of hundred metres, these three finished with in a minute. I was told afterwards that Nine Dragons changed headsails for the beat to the finish and that was the difference. Not too far behind them was the Beneteau40 Just a Dash pipping the X 45 ToyBox2 to the line. Good racing, however these leaders were beaten on handicap on the day by the Sydney36 Stormaway. At this stage the Americas Cup is anyone’s, the New Zealanders haven’t won a race in 6 days and only need one to take the Americas Cup back Downunder. Team USA skippered by Aussie James Spithill has a breath of fresh air and could easily take the next three races and retain the Cup in San Francisco. The racing has been far better than I thought in the final. The teamwork to sail these 72′ wingsailed cats around the course is incredible, my congratulations go to both teams for the great sailing. Of course it’s fantastic to have the on board vision and audio. I do miss the insights of Nathan Outteridge in the last few days, his perspective after each race was fantastic. I can only think of what it takes to sail one of these beasts and I look forward to catching up with those Aussies who have sailed one on their return to Australia. Nathan and his 49er crew Iain Jensen are now at the 49er Worlds. Having won the last couple and the Gold medal last year, they are the team to beat, however they haven’t competed since London 2012 due to their Americas Cup and Team Artemis comitments. We wish them all the best. In the meantime, I’m getting organised for my next interstate trip, this time to Adelaide and country South Australia then on to Victoria and everyone there. Two weeks on the road, a full on DeckHardware road trip on October. There’s been a bit on over the last few weeks. A few weeks back I flew over to Perth for 4 days of seeing DeckHardware customers. 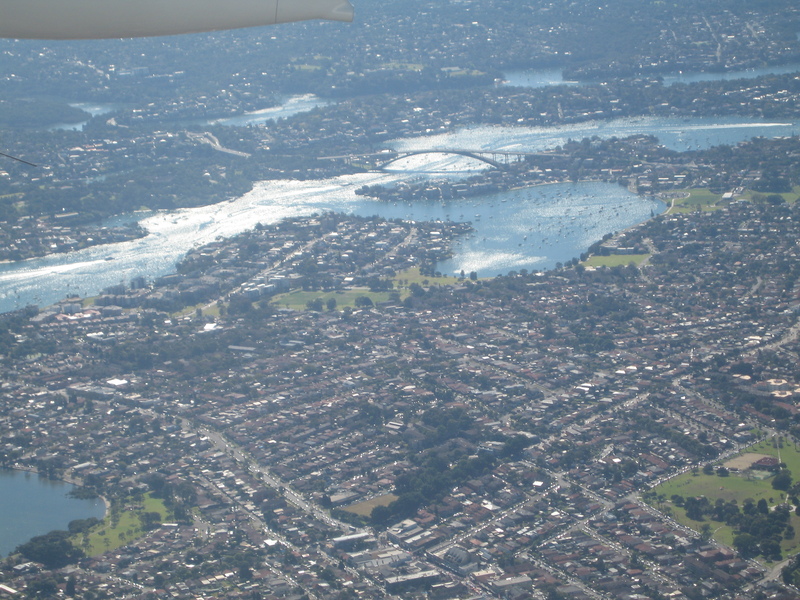 Flying out of Sydney, I finally remembered my camera, so took a couple of quick shots, I’m always looking at the differing conditions as well as the view. Driving some 800 kms and seeing 37 different outlets both old and new was pretty much nonstop during the day. I saw many outlets from Perth to Bunbury on this trip, with some stops relatively short and others spending what seemed a couple of hours going through many of our product range. With so many now, by the time I get through some of the new products and remind them of the others, it’s easy to see how the time flies. One thing for sure is that I’ll need a fifth day, as I didn’t have the chance to go to Geraldton or Albany as I have had on previous trips. A deal of the time is spent making sure that those on the database we have are still operating, some had closed and some have moved. Even if it’s just down the road, it’s surprising many don’t forward the new information. There are those who had moved and it was a bit of a pattern change seeing them in new premises. It’s surprising that as a sales representative how things fall in to a pattern, driving around many suburbs only to find the person or company is around the corner from someone you already know. 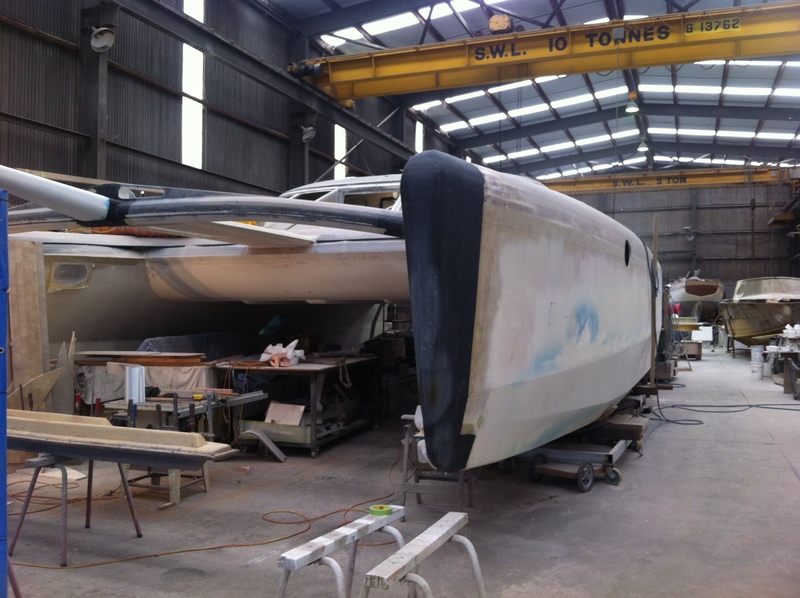 The catamaran as shown in the photo is being fitted with a variety of DeckHardware products, including a range of Forespar Marelon plumbing. It’s always good to see progress of some of these new builds. It was good to catch up with a few old friends, once again I was lucky to be hosted by Rachel Cox in Fremantle. We shared a few good meals and caught up with a bit of good old gossip. It was also great to meet up with Colin and Katie Spence for dinner on one night. I last saw them in Sydney when Katie was several months pregnant with their now 2 year old son Connor. Hopefully it won’t be as long till the next time we catch up. The other side of things is that while going around all of these boatbuilders, riggers, sailmakers and retail outlets, is that some are also at the various clubs around the country. Therefore I have the chance occasionally to have a quick look around and see new and differing ideas used on some of the boats I don’t see on a regular basis. With the Sydney sailing season just about on us, I spent a day along with two of the Volunteer MHYC start boat team Steve and Toby, going over the clubs start boat Hugh S George in preparation for the season. It was a day of typical boat owner type things, cleaning and throwing out unwanted rubbish, re-marking the anchor chain each 10m, vacuuming etc. Nothing special, just a spot of housekeeping. As a prelude to the season opening the race officials from around Sydney Harbour had a meeting at Royal Sydney Yacht Squadron. Here we had a briefing with the NSW Yachting Association chief David Edwards and had a presentation by a RMS boating officer. He had various videos from both shipping and ferries on the dangers of passing their bows too close and why they have strict regulations as to how close yachties can get. It’s pretty unbelievable what some will do. Luckily none of those shown were from our club. With help once again from Melissa and a few of the parents, I ran a small regatta for Optimists and 420s. Somehow, every event lately for them has been held in light or drifting conditions. It would be nice to have a pleasant day with good wind just once if someone can assist? Saturday was the start of the 2013/4 sailing season at Middle Harbour Yacht Club. The club volunteers enjoyed a buffet breakfast, the Juniors put on a few fun races in the Optimist dinghies and once again we had the pleasure of leading the fleet in the annual sailpast. Then many of the fleet took part on the annual Commodores Cup. Next week is the start of the racing season and there’s plenty eager to get out there again. Hopefully we’ll see some great racing and lots of good weather. Sunday was the start of the America’s Cup with the New Zealand challenger taking out both opening races. Finally we saw some great racing with the lead in the first race changing several times. With races 3 and 4 now sailed, we have a boat race. I know the races are a lot shorter in a sprint fashion, but it’s great watching match racing at these never seen before speeds. One bad tack, gybe or even a nose dive will hurt. I for one can’t wait to watch the remainder of the 34th America’s Cup. Another positive is the feedback and information coming off the boats. As an active sailor and race official, listening to the afterguard discussing what to do next is fantastic. We also have the expert opinions from the likes of Nathan Outteridge the skipper of Artemis AC72 giving his impressions. Great stuff. Now for a few more races from San Francisco and from Saturday the regular Sydney season starts.